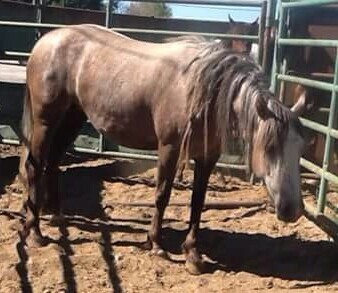 Ireland was rounded up as a baby in Nevada, taken from the wild with her family, chased by a helicopter into a trap and then immediately separated from her mother when she needed her the most. She was adopted right there and taken away with another foal named Luna. I can only be glad that they had each other during that scary time and they were adopted by a well know anti-mustang ranching family. They were then dumped together at Fallon Feedlot, hours away from shipping to slaughter. We managed to rescue her just in the nick of time and are so thankful we did. She was completely terrified when we got her and now likes to be around people and is the first to the fence to look for treats and snacks. She was described as being heavily pregnant which is so appalling that they were about to ship her to slaughter in that condition. Many horses do not make the long hauls to Mexico or Canada and the weaker horses often fall and are trampled to death by other horses in panic on the truck. Another rescue saved her friend Luna but when they realized the two horses were friends they reached out to us to keep them together. Luna and Ireland are still at Skydog Oregon.